Wooster Pro Chinex paintbrushes are made with the famous DuPont filament, but stand out among other Chinex brushes. A special tipping process allows these brushes to create a clean, precise paint stripe. These brushes are perfect for today's low VOCs and fast-drying paints and stains. The 2.5 inch (63mm) Angled Legacy paint brush is a premium white bristle brush designed for oil based paints, varnishes, polyurethanes and stains. This angular brush size is best suited for medium to larger-sized jobs such as walls, doors, crown mouldings, cupboards, and larger-sized furniture. The soft bristles provide the smoothest finish and is ideal for interior painting. The 2 inch (50mm) Angled Legacy paint brush is a premium white bristle brush designed for oil based paints, varnishes, polyurethanes and stains. This angular brush size is best suited for smaller to medium-sized jobs which include doors, cabinets, mouldings, baseboards and medium-sized furniture. The soft bristles provide the smoothest finish and is ideal for interior painting. Diamond Pro Trylon brush filaments are made with a unique proprietary blend of ingredients, which allow the Angular Sash Brush to pick up and release more paint, allowing you to finish paint projects faster. It has excellent performance in high heat and humidity and offers better levelling with today's heavy-bodied, fast drying, low/no VOC paints. 1-1/2 in. 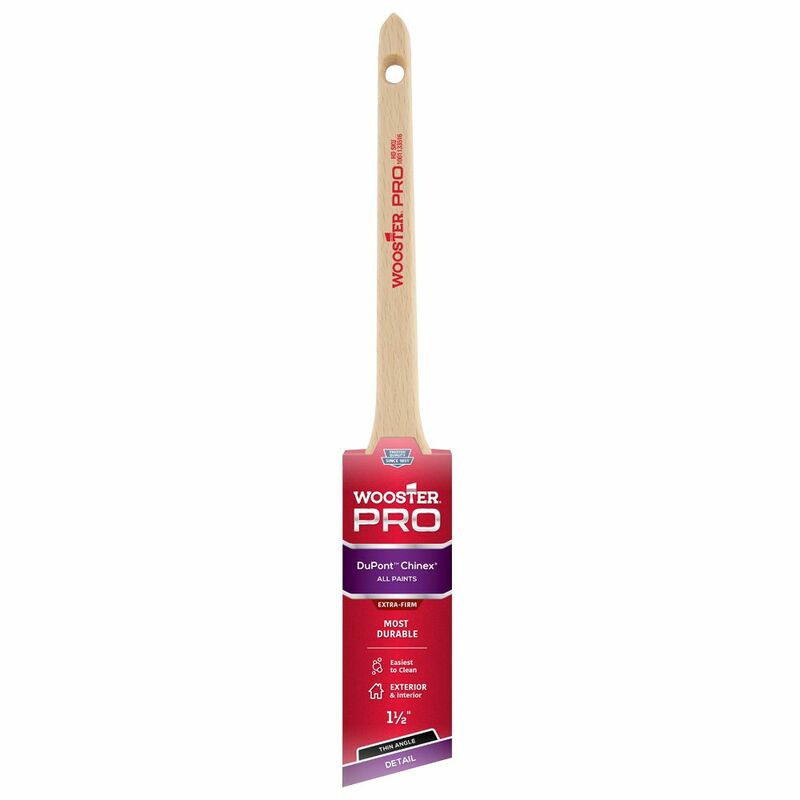 (38mm) Wooster Pro Chinex Thin Angle Sash Brush Wooster Pro Chinex paintbrushes are made with the famous DuPont filament, but stand out among other Chinex brushes. A special tipping process allows these brushes to create a clean, precise paint stripe. These brushes are perfect for today's low VOCs and fast-drying paints and stains.